Entirely surrounded by ancient ramparts, Mdina is a magical place where the modern age seems far away. The picturesque medieval walled city has a special enchantment, found in the enclosed labyrinth of narrow, twisting streets and the old sandstone buildings that glow a rosy hue in the sunlight. Quiet lanes lead to shaded courtyards, and magnificent palaces are hidden behind large wooden doorways. This UNESCO World Heritage city is a popular day-trip destination, but by evening, this charming town lives up to its reputation as the "Silent City." Mdina overlooks a tranquil countryside of rolling hills and borders Rabat outside its western ramparts. In contrast to the more touristy Mdina, Rabat is a real working city with several interesting historical attractions, all within walking distance from Mdina. As a typical walled city, Mdina's immense ancient ramparts give the town a fairy-tale charm. Known as the Cittadella (Citadel), the town's fortifications date back to the Medieval Period when the city was ruled by the Arabs and Normans. 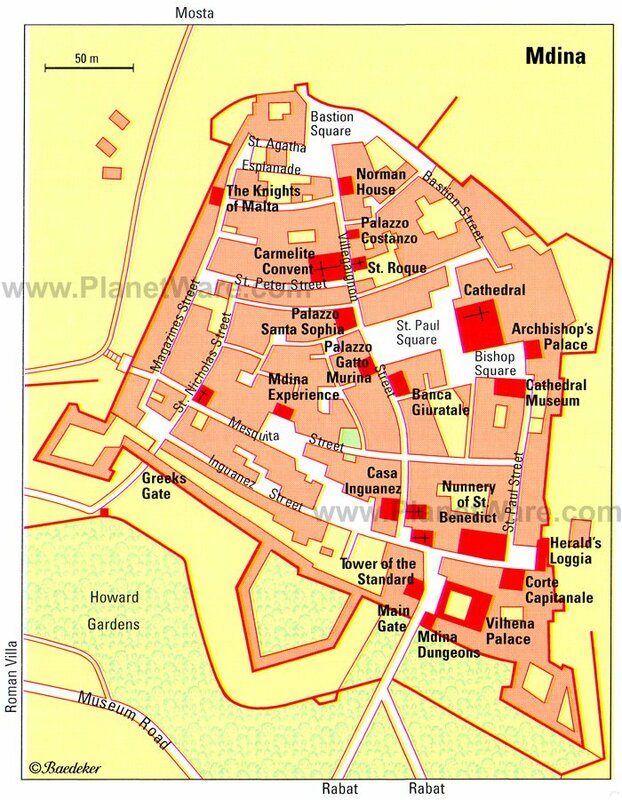 The most obvious influence of the Arab occupation is Mdina's labyrinthine street plan. The ancient winding streets and atmospheric pedestrian alleys are characteristic of Islamic urban design in the Maghreb (Morocco, Algeria, and Tunisia) during the Middle Ages. The town's elegant Main Gate, designed by de Mondion, was built in 1724 in splendid Baroque style. It is an excellent example of Baroque design. The escutcheon bears a coat of arms, and statues of growling lions stand proudly in the front of the gate. Enter this dramatic doorway to leave the 21st century behind. Within Mdina's panoramic bastions and cool narrow lanes, there is a special ambience of Old World elegance. Graceful squares are lined with aristocratic buildings and ornate Baroque churches. Only residents' cars are allowed inside, and even the street signs are scripted on porcelain plaques. The bastions of the ramparts, including the Saint John's Bastion and Saint Martin's Bastion, provide excellent viewpoints of the idyllic countryside surrounding Mdina. Mdina's cathedral was originally built in the late 13th century and dedicated to Saint Paul. After being damaged by an earthquake in 1693, the cathedral was rebuilt in 1702. This splendid Baroque building was designed by Lorenzo Gafà with a gorgeous facade featuring Corinthian columns. The bright and spacious interior has an inspiring dome that allows light to flood into the sanctuary. The cathedral's opulent decor features marble inlay floors, gilded detailing, pink marble columns, and breathtaking ceiling paintings. Wonderful treasures of art are displayed throughout the cathedral's various chapels, and many of Malta's bishops are buried here in the side chapels. The most prized possession of the cathedral is the 12th-century Byzantine icon of the Madonna in the Chapel of the Blessed Sacrament. This precious painting is surrounded by a bejeweled frame in front of a dazzling altarpiece. The cathedral boasts several renowned Mattia Preti paintings including the Conversion of Saint Paul on the Way to Damascus behind the altar, a piece that depicts Saint Paul on a White Horse in a side chapel, and the dramatic Saint Paul's Shipwreck painting above the altarpiece. Other artistic highlights are Domenico Bruschi painting of Mary and the Angels, which illustrates a serene image of divinity and the wooden Crucifix sculpture by Fra Innocenzo da Petralia Soprana. The pillars in the Presbytery feature impressive mosaic medallions by Luigi Moglia of Rome. The second oldest building in Mdina, this magnificent 13th-century palazzo exemplifies Sicilian-Norman style. This typical medieval palace was the residence of Maltese nobles and is now a museum open to the public. Unusual among historic palaces, the Palazzo Falson displays the original decor of oriental rugs, antique furniture, and fine paintings. The library contains more than 4,500 books, and the kitchen displays the old cooking equipment. Each of the rooms on display is a treasure trove of art works. Highlights of the palace's art collection include 17th-century paintings by Sir Anthony Van Dyck, Nicolas Poussin, Bartolomé Esteban Murillo, and Mattia Preti, the most famous painter of Malta. There is also an impressive assortment of jewelry, hand-painted Brisé fans, and antiquities such as ancient Roman coins. One of the most prized possessions of the Palazzo Falson is the Alof de Wignacourt Medal dating to 1607, a rare medal depicting the Grand Master. The museum's café has a pleasant outdoor terrace with stunning panoramas where visitors can soak up the sunshine and the sweeping views of the rural landscape surrounding Mdina. The outlook extends all the way to the sea. Hidden behind an elegant Baroque facade is the spiritual retreat of the Carmelite Priory, one of the most important religious buildings in Mdina. Built between 1660 and 1675, the Carmelite Priory is still a functioning monastery run by the Order of the Brothers of the Most Blessed Virgin Mary of Mount Carmel and is the only priory in Malta open to the public. Guided tours led by a friar take visitors to the Refectory (where the friars customarily shared meals in silence while listening to the Word of God), the Carmelite Church, the kitchen, and a typical friar's cell. In the chapels of the exquisitely domed church are masterpieces of art from the 17th to 19th centuries. The Carmelite Church is considered one of the most important Maltese Baroque churches. There are six paintings by Giuseppe Calì, including the Virgin of Sorrows and an 18th-century statue of the Virgin of Mount Carmel by Maltese sculptor Andrea Imbroll. The church also displays Stefano Erardi's Annunciation and a collection of paintings by Mattia Preti and his bottega. Visitors may participate in the daily prayers and Sunday mass. In the monastic tradition of hospitality, the Priory has opened the Theos Restaurant in its Parlor, a lovely and peaceful space with original painted ceilings. The restaurant serves lunch and dinner, and the cuisine gives visitors a taste of the Carmelite's history. The menu features regional Maltese dishes and other Mediterranean cuisines including Greek, Ottoman, and Calabrian. This culinary theme reflects the origins of the Carmelite religious order, which came from Mount Carmel of the Holy Land (present-day Israel) in the 12th century, migrated to Cyprus and then to Sicily before arriving in Malta in 1370. To further share its spiritual heritage, the Carmelite Priory hosts seminars, exhibitions, and Baroque music concerts throughout the year. The Cathedral Museum is on the same elegant square as the cathedral, next to the Archbishop's palace. A ticket to the Cathedral of Saint Paul includes entrance to the Cathedral Museum. Housed in the cathedral's seminary, a lovely Baroque building constructed between 1722 and 1742, the museum displays ecclesiastical objects of art from the cathedral. The museum is considered to have one of the best religious art collections in Europe. The collection includes a wide range of sacred art as well as Roman antiquities. There are fascinating documents from the 15th century, including the Inquisitor's Archives. One of the collection's highlights is a medieval Polyptych of Saint Paul, which was part of the main altarpiece in the cathedral. The museum features many masterpieces of European painting, especially works from Spain beginning with the Spanish Romanesque until the 17th century. Also noteworthy are the woodcarvings by Albrecht Durer. This graceful square stands at the edge of Mdina's Citadel Walls with a bastion overlooking the landscape around the city. Encircling the spacious square are elegant buildings constructed from golden sandstone with vibrantly painted shutters and grand doors featuring bronze knockers. At the edge of the Ramparts is a wonderful viewpoint. Take time to admire the panoramas of the surrounding countryside. The patchwork of farmland on the rolling hills extends all the way to the Mediterranean Sea. It's even possible to see the Mosta Dome in the distance. Near Bastion Square on Villegaignon Street is the Palazzo Santa Sofia. This is considered one of the oldest palaces in Malta and is Mdina's best preserved medieval building. The date on the plaque of this manor says the structure dates from 1233. The upper floor was added in 1938. Mdina's Natural History Museum is housed within the Magisterial Palace of Justice, an impressive 18th-century building. The palace was designed in Parisian Baroque style for the Grand Master Antonio Manoel de Vilhena. The Geology and Paleontology collections are especially extensive, with more than 10,000 different types of rocks and minerals as well as an excellent selection of fossils. Other exhibits feature birds, fish, shells, insects, and mammals, including displays of their natural habitats. The museum's collection even features the largest squid found in Maltese waters. There are special sections dedicated to Malta's national bird, the blue rock thrush (Il-Merill) and the national plant, centaury (Widnet il-Bahar). The museum is also worth visiting just to see the gorgeous courtyard and stunning interior of the Palazzo Vilhena. Next to Mdina's Main Gate, beneath the Vilhena Palace, this museum illustrates the history of prison life in Mdina. The attraction features underground chambers, passageways, and cells that were once occupied by prisoners. Scenes have been recreated that show the brutality of medieval-era Maltese prisons. During the Middle Ages, instruments of torture were commonly used in prisons. This museum shows the darker side of Malta's past while explaining the historical context. Admission to the Palazzo de Piro is included with a ticket to the cathedral and the Cathedral Museum. The collection of historical tools is worth a quick look, although it appeals to a niche audience. The wide range of objects on display includes traditional lace-making tools, woodworking equipment, and even an antique waffle iron. The Palazzo de Piro also houses the Cathedral Museum Extension and hosts temporary art exhibits as well as cultural events such as classical music concerts. Visitors will enjoy a relaxing stop at the lovely Xpresso Café and Bistro on the ground floor and in the courtyard of the building. From the café terrace, there are sensational views of the Maltese countryside around Mdina, from the rolling hills all the way to the sea. Many of the quiet side streets of Mdina lead to hidden chapels with noteworthy architecture and works of art. The Chapel of Saint Nicholas (Triq Inguanez) is in one of the oldest and most tranquil quarters of Mdina where many of the 16th- and 17th-century buildings have survived. The majestic little chapel was built in 1550 and remodeled in 1698. Also on Triq Inguanez, just a few paces away (cross street Triq Villegaignon), the Chapel of Saint Agatha is a tiny place of worship featuring a decorative altar with a painting of Saint Agatha in a gilded frame. The Chapel of Saint Agatha was founded in 1410 and was reconstructed by Lorenzo Gafà in 1693 after an earthquake destroyed the original building. The chapel served as a shelter for refugees during the Second World War. In the heart of Mdina, this historic palace was converted into a luxurious five-star hotel that is part of the prestigious Relais & Châteaux association. Presiding over a quiet square, the 17th-century palazzo was a local nobleman's house that once belonged to the Strickland family. The hotel rooms feature opulent decor with Parisian bedding, original paintings, antique tapestries, and period furnishings. Xara Palace hotel has an award-winning de Mondion Restaurant for an indulgent fine-dining experience. The more casual Trattoria AD 1530 offers shaded tables spilling out onto the piazza. The Xara Palace Relais & Chateaux: 5-star luxury boutique hotel, 17th-century palace, antique furniture, Parisian fabrics, rooftop restaurant with panoramic views. Corinthia Palace Hotel & Spa: luxury San Anton hotel, 2.7 miles from Mdina, quiet location, indoor and outdoor pools, fitness center, holistic spa. The Parish Church of Rabat is dedicated to Saint Paul, the father of Christianity in Malta. The church was built next to the site of the grotto where it is believed that Saint Paul found shelter after his shipwreck on the coast of Malta in 60 AD. This 17th-century Baroque church has an ornately gilded sanctuary with a monumental dome and a grand Latin-cross plan. The church's most prized artwork is The Shipwreck of Saint Paul painting by Stefano Erardi. This famous painting depicts Saint Paul shaking off a viper in front of the barbarians and the Romans as his ship is pounded by the stormy seas. After visiting the Parish Church, tourists may descend an adjacent flight of stairs to the Grotto of Saint Paul. In this grotto is a small underground shrine dedicated to the saint. The Statue of Saint Paul in front of the church was donated by Grand Master Pinto in 1748. This grand 16th-century palazzo once belonged to a noble Maltese family of French origins. Behind the simple facade is a lavish aristocratic mansion, which is still a private home. Originally, the building was a medieval watch tower built on the site of ancient Roman ruins. The palace takes its name from proprietor Dr. Salvatore Bernard, who was the personal physician of the Grand Master of Malta. The mansion has been beautifully restored to its former glory. The lovely rooms feature antique furniture, masterpieces of paintings, and noteworthy objects of art. Highlights are the barrel-vaulted entrance hallway, the exquisitely decorated drawing rooms, and the peaceful courtyard. Casa Bernard is open Monday through Saturday for guided tours, available on the hour. Visitors will gain insight into what life was like for the Maltese nobility. The Roman Villa, also called Domus Romana, is a museum that houses the remains of an impressive ancient Roman Empire townhouse from the beginning of the Christian era. This important archaeological site features astounding mosaic floors (dating to the 1st-century BC) that adorned the various rooms. These mosaics are some of the oldest examples in the western Mediterranean outside of Rome and reveal incredible craftsmanship by highly skilled artists. The Domus Romana also includes the only set of marble statues portraying the Emperor Claudius and his family that were found in a private house anywhere in the Roman Empire. With its collection of everyday household objects of the Classical era, the site gives visitors a look into the private life of a Roman aristocrat. Saint Paul's Catacombs are a complex of Roman-era cemeteries that were in use up to the 4th century AD. The catacombs are on the outskirts of the old Roman capital city of Melite (present-day Mdina). Since ancient Roman law prohibited burials within the city, Saint Paul's Catacombs became the most important Christian burial site. These catacombs represent the earliest and largest archaeological evidence of Christianity in Malta. The complex encompasses interconnected passages and tombs covering an area of more than 2,000 square meters. This site was named after Saint Paul because it was associated with the Grotto of Saint Paul, which also once served as a Christian hypogeum (catacombs) during the Punic and Roman era. The Wignacourt Museum is next to the Parish Church of Saint Paul. The museum is housed in the Baroque Collegiate Hall of the Chaplains of the Knights of Malta inaugurated by Grand Master Alof de Wignacourt. The building still features the chapel used for private devotions by the residing Chaplains. The museum's outstanding collection includes fine art as well as Punic-Roman archaeological finds discovered at nearby sites. The main floor displays important paintings with works by Mattia Preti and other Maltese painters as well as European artists. The museum also displays old relics and reliquaries, and a unique wooden altar used for the celebration of Mass by the Order of the Knights of Malta. Among the assortment of maps, coins, prints, and rare books is the manuscript of King Henry VIII's Septem Sacraments written to counter Martin Luther's arguments.